This 2010 documentary is about American public education and its failures. I suppose the target audience for this film is actually the United States itself however as a documentary, I found it well done and an eye opener for anybody about the importance of education and what happens if you continue doing what may not be working. Half way through the film, the director gives us a list of statistics which I believe sums up not only what the film is about but proves its premise about trouble in paradise. U.S. schools have failed since the 1970's to keep pace with the rest of the world. Out of 30 developed nations, the U.S. ranks 25th in math and 21st in science. The top 5% of U.S students, the very best, actually rank 23rd out of 29 developed countries. In almost all categories the U.S. has fallen behind except one. While U.S. students ranked last in math in one study, the same study showed that U.S. students had the highest degree of confidence. The study asked each student how they did on the test and the U.S. students consistently said they thought they had done well even though they ended up being last. Mr. Guggenheim's point in this film is that the American education system is in trouble; it is under-performing and if American doesn't do something, the nation may find itself without the necessary resources, that is, trained, educated people. However, during the course of the film he shows us that some people are doing something about or at least trying. It certainly comes across that the "way of doing things" is firmly entrenched in the U.S. and the status quo just doesn't take kindly to change. In fact, I would say that inertia is rampant. Some of what's going on seems totally absurd. After pointing out the connection between failing schools, bad teachers and a terrible drop-out rate which invariably leads people to trouble, the director cites the following costs. In Pennsylvania, 68% of the prisoners are high school drop-outs. The state spends $33,000 per year to house an inmate in prison; an inmate who pays no taxes and essentially does not contribute to society. The average sentence is 4 years so that works out to a total of $132,000. On the other hand, the average private school costs $8,300 per year in this state. The state could send a kid to a private school, kindergarten to grade 12 at a total cost of $107,900 and still have $24,100 left over for other things. The reasoning is that good schooling would decrease the drop-out rate and more than likely lead to good citizens. For the last superpower in the world, seeing this is startling. Just what abyss is America headed towards? I find it amusing how the right wingers all shout about the impending socialism of Obama and health care and yet seem to be totally missing the point about the role of any modern government in bringing to its people the basic necessities, no the basic rights for all citizens. Throughout the film, the director talks with several people of note who are attempting to bring change to the system. Geoffrey Canada is an educator and social activist who has deeply involved in the Bronx of New York. He is interviewed about his ideas and his projects to bring not just education but successful education to inner city children. His HCZ (Harlem Children's Zone), a non-profit organization for poverty-stricken families has been endorsed by President Obama with a plan to replicate the HCZ model in 20 other cities. Michelle Rhee is the chancellor of the District of Columbia Public Schools. Her tenure since 2007 is quite a story and one worth reading unto itself. Here is somebody who controversially closed schools, sacked teachers and rewrote the book on the relations between the school system and the teachers union. While she has made quite a number of enemies, her methods do seem to be producing noticeable changes in the success of Washington's students. This gentleman is an American film director and producer. As a producer, he has been involved with the televisions shows Alias, The Shield, 24, NYPD Blue, ER, Deadwood and Party of Five. He was director of Deadwood for the first season in 2004. He directed and produced Al Gore's An Inconvenient Truth which won the Academy Award for Best Documentary in 2006. He also directed and co-produced It Might Get Loud a 2009 film which explored the history of the electric guitar while focusing on the careers of Jimmy Page (Led Zeppelin), The Edge (U2) and Jack White (The White Stripes). In the opening of this film, he says one of the inspirations for making this film was the fact he had to make decisions about the education of his own children but realized he was lucky enough to be able to afford private schooling. He knew that not everybody could afford private schools. It would be interesting to talk with Canadian professionals to get their thoughts on the film and how applicable the ideas are to the Canadian school system. For American readers, visit the official movie web site to get further information on taking action. All in all, the film is a good documentary and it is well worth the time to reflect on how education is determining the future of our children. Education is the key and without the key, the door to the future is locked. 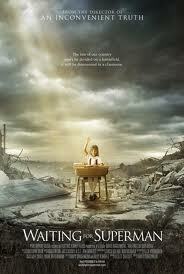 Waiting for "Superman" is a 2010 documentary film from director Davis Guggenheim and producer Lesley Chilcott. The film analyzes the failures of the American public education system by following several students as they strive to be accepted into a charter school. N.B. This link is for Canadians only. Americans must go to http://comedycentral.com and find the episode for Oct 7/2010. The site has other resources about just how to take action. certainly sounds worthy of a watch. When I first heard about this documentry I thought it had something to do with the actual Superman movies. I would also like to see what the Canadian people think. Great post!